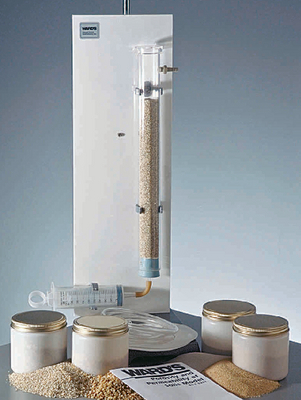 Study the relationship between particle size and porosity, gravitational water and usable reserve, the effect of grain size on permeability, and Darcy's Law, all with one model. Fill the plastic cylinder with sand and soil samples, and inject water into the column with the included syringe. It comes with a cylinder, 100 mL syringe, platic base, mounting pin for attachment to a ring stand, sample sands, filter paper, and user's guide. Mounting Pin size: 4 1/2"